The finished soup, ready for a tureen or individual bowls. It was really good. I’ve never had celery soup before. Not from a can (thank goodness), not made by others, not any at any time. I don’t even think I’ve had it “in” anything else. Is that weird? It just sounds so banal and uninspiring. Celery soup. This is the celery sold in groceries, and that I used. Don’t get me wrong. 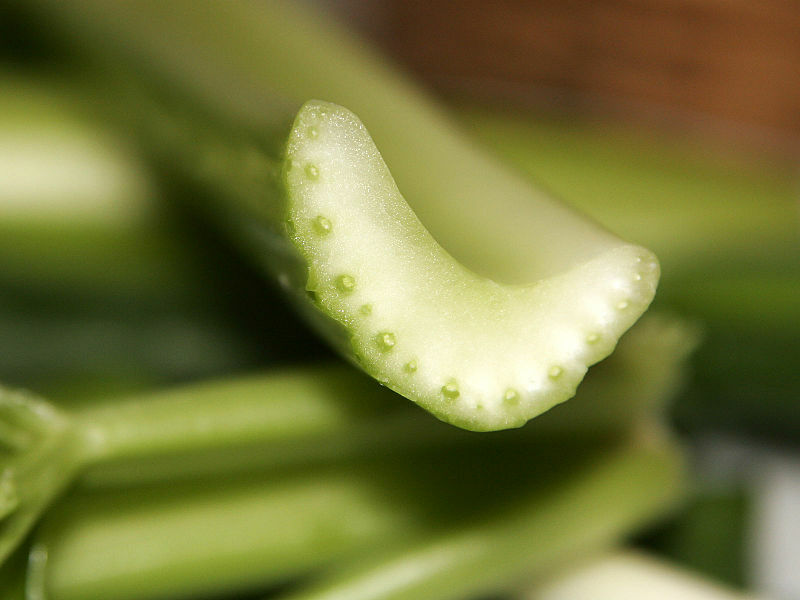 I actually like raw celery. Just on its own, or slathered in cheese whiz…yes, cheese whiz… A guilty pleasure. I usually purchase celery because I’m making something that uses one stalk. Then the rest goes in the refrigerator and is forgotten. Until its discovered in a “less than pristine” state. I don’t know how many bunches of celery I’ve let go to waste. I’ll regret it when I’m old and poor. But there’s lots I’ll regret besides just that… as will we all. My days of waste must come to an end. If you want to find out ways to squeeze a penny until it screams keep reading this blog. I believe it’s time for my posts to seriously turn to a less wasteful and more sustainable way of living. How to use what you have, how to “make” rather than “buy”, homemade kitchen substitutes. Sounds like a worthy pursuit. What do you think? But back to the celery. You remember the celery, right? I had all but one stalk of a whole head to use. Just because you have to use something before it spoils shouldn’t mean you have to settle for second best. If anything a good chef/cook can turn nearly anything into a feast. Sort of like a MacGyver of the kitchen. For those who don’t know, MacGyver was a TV show in North America where the hero always seemed to be able to solve problems with everyday materials that were on hand. As my Creative Director said on Friday: “let’s make a canoe and bow and arrow out of this piece of string and toothpick.” MacGyver was kind of like that. Hmmm. I just got distracted again… Let’s just say that roasting a vegetable turns something just tolerable into something amazing. It actually does it with several vegetables many people may dislike. Squash, asparagus, cauliflower, potatoes, you name it. and 2 garlic cloves cost? And it serves 4-6 people. Roasting brings out the natural sugars in the vegetables and adds hints of smokiness that just aren't there without that technique. I puréed the heck out of mine and lived with whatever small pieces I may have missed. Once again, why waste a nutritious part of a vegetable? I now have no more excuses for letting that bunch of celery go to waste. This was a delicious and filling soup. One thing I didn’t know is that celery is one of the few foods that provokes anaphylactic shock in some people, like peanuts do for others. So be aware of that rare, but potentially fatal, allergic reaction. Celery allergies seem to be most common in Central Europe; the EU requires all foods that may have celery in trace amounts to be clearly labelled, just like we have in North America with peanuts. down any small pieces that may have been missed. Peel and chop the carrot and potatoes into medium sized chinks. Wash and chop the stalks of celery into 3” long pieces. Arrange all on the baking sheet and toss with the olive oil. 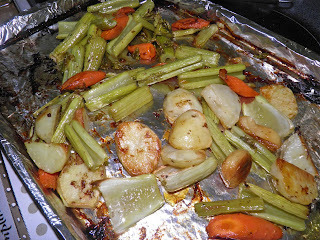 Bake the vegetables for 50-60 minutes, turning half-way through, until they begin to brown slightly. Let cool completely. This step can even be done a day ahead. 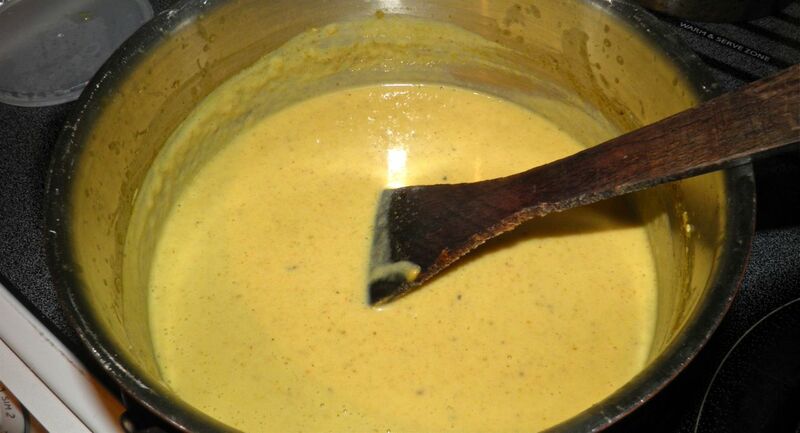 In a food processor, purée the roasted vegetables in two batches with a cup of chicken stock added to each batch. Purée until it’s as smooth as you can get it. Put the puréed soup in a stock pot. 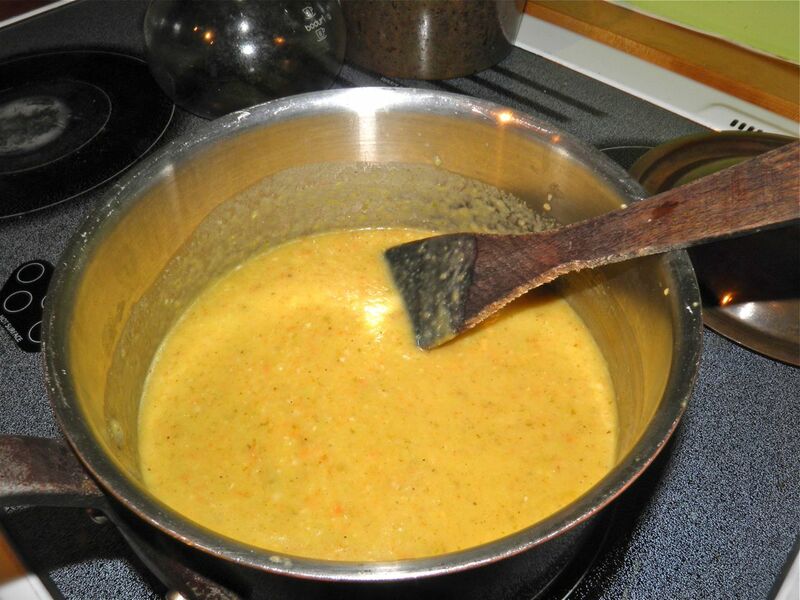 After the vegetables are puréed, add one more cup of chicken stock and some salt and pepper. Bring the heat to simmer and let cook for 15 minutes. At this stage you can put the soup through a sieve if you wish. I prefer to keep all of the vegetable fibre so I did not. Add the cream and bring just to a simmer. Taste for salt and pepper and adjust. I would like to contact you regarding an article on mustard, but cannot find your contact info. Please email me. Thanks.